In 2016, the classic original line-up of Dokken featuring: Don Dokken, George Lynch, Jeff Pilson, and Wild Mick Brown reunited to play the world famous Loud Park Festival in Japan and one exclusive U.S. show in Sioux Falls, SD at Badlands. Fortunately for fans not in attendance at either show, cameras were there to capture the performances and now Frontiers Music Srl is set to issue “Return To The East Live (2016)” on April 20th! 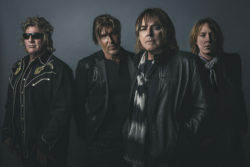 In addition to the live recording, the original Dokken lineup entered the studio together and recorded a new song “It’s Just Another Day,” for the forthcoming release. The band shot a video for the song which can be viewed HERE. “It is stunning how amazingly and naturally this song came together. George and I just let it flow for the music and Don came in and finished the lyrics and nailed his vocal in record time. Everything just flowed. And the result is such classic Dokken, unbelievable. It’s really a testament to chemistry that doesn’t go away despite the years and all the trials and tribulations. These are the moments I live for,” says bassist Jeff Pilson. Watch a live video of ‘In My Dreams’ HERE. If the release wasn’t amazing enough, the package includes a brand-new studio track,”It’s Just Another Day” and two acoustic re-workings of classic tracks, from the original members!